Delegates are gathering in Washington DC for the largest ever summit of African leaders in the US. Nearly 50 heads of state are expected to attend the three-day event, which began on Monday. US Commerce Secretary Penny Pritzker has said about $900m (£535m) in business deals will be formally announced during the event. But the presidents of Liberia, Guinea and Sierra Leone have cancelled their plans to attend amid an Ebola outbreak. The disease has killed more than 800 people across West Africa. US President Barack Obama promised to convene a summit during his three-country Africa tour last year, when he visited Senegal, Tanzania and South Africa. The summit's focus is on trade and business with the continent, where the US lags behind China, says the BBC's African Service editor Solomon Mugera. China has a trade volume with the continent of $200bn (£119bn), more than double the US, and it started the Africa summit trend in 2001. Japan, India and Europe have followed. The summit also comes shortly after Ghana has said it will seek financial aid from the International Monetary Fund (IMF) to help strengthen the West African nation's currency, which has become one of the world's worst-performing currencies this year. In 2013, 67% of African trade with the US was conducted by only five countries - Nigeria, South Africa, Angola, Egypt and Algeria. The US imports more from these nations than it exports to them, with mineral fuels accounting for over half of the commodities going to the US. Foreign direct investment (FDI) figures show a similar pattern - the top five destinations in Africa accounted for 74% of total FDI from the US in 2012. Nigeria, South Africa, Egypt and Algeria are again amongst these countries, with Mauritius replacing Angola as the fifth. And while China does much more trade with Africa than the US, research by the International Monetary Fund shows that it is also limited to a handful of countries. 75% of exports to China from sub-Saharan Africa came from only five countries in 2011, and six countries account for 80% of imports from China. Central African Republic, Eritrea, Sudan and Zimbabwe have not been invited. Zimbabwe's Information Minister Jonathan Moyo has dismissed the snub as a "non-issue". "We understand this to be America pursuing its interests, afraid that China has made headway," Mr Moyo told the state-owned The Herald newspaper. Mr Obama will host a dinner for the attending African leaders at the White House on Tuesday after a day-long business forum hosted by the US commerce department. On Wednesday, African leaders and the US president will meet during sessions on business, security and governance. 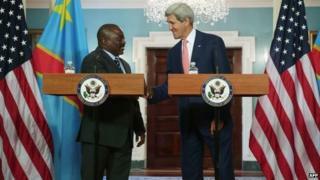 Critics of the summit have focused on the lack of one-to-one meetings between Mr Obama and his African counterparts. And the invitation of President Yoweri Museveni of Uganda has attracted the ire of gay rights activists after he signed a law earlier this year imposing tough penalties against homosexuality. Aside from the 2013 tour, he has made only two trips to sub-Saharan Africa during his presidency - one brief stopover in Ghana, in July 2009, and a visit to South Africa for Nelson Mandela's funeral. What does Obama hope to achieve at summit?